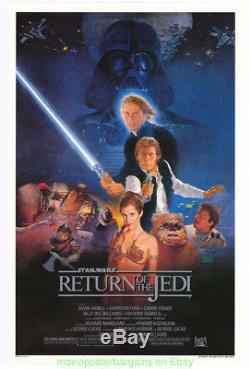 RETURN OF THE JEDI MOVIE POSTER 27x41 Style B Original Mint One Sheet STAR WARS. The movie stars Carrie Fisher , Harrison Ford , and Mark Hamill , and was directed by George Lucas. THE POSTER IS MINT EXCEPT FOR A LITTLE , VERY LITTLE EDGE CRINKLING IN THE PAPER IN THEB LOWER RIGHT CORNER ABOUT A INCH IN THE WHITE BORDER OF SOFT CREASING OF A LIGHT NATURE. It is the style B and is one sided. I've included several close-up shots of this posters artwork. The fake of this poster was from Francis in London, England who has thousands of fake auctions every week thru many dealers and is the man responsible for most of the worlds fake movie poster trade. His garbage is the wrong size usually only 39 inches high , out of focus , splotchy , and does not have the expensive metallic ink the original has in this case either. I still have about 125 left of these and I've had them since the 1980s. THESE RATES ARE FOR USA CUSTOMERS ONLY! I don't sell unlicensed reprints, especially by misrepresenting them as original , all auctions are for theatrical distribution studio issued one sheet size 27 by 40 inch original movie posters unless otherwise noted. For 90% of my auctions UNLESS the rates below are different - TAKE A LOOK!! RUSH ORDERS - LIKE NOT O. ABOUT THE POSTER PHOTO'S. SOME EXAMPLES -A DATE IS CHANGED AT THE BOTTOM OF THE POSTER FOR THE RELEASE OF THE INCREDIBLE HULK BUT THE ONE I SENT WAS THE OLD DATE HE DIDN'T WANT. THE SHERLOCK HOLMES I SENT WASN'T THE ONE THAT HAS HOLMES FOR THE HOLIDAY'S TAG LINE ON IT HE WANTED. I GUARANTEE THE ARTWORK MATCHES THE PHOTO BUT NOT EVERY NUANCE BETWEEN THESE VARIOUS PRINT RUNS THAT THE STUDIO'S PUT OUT - SO THE PHOTO WILL CORRECTLY MATCH THE POSTER'S ARTWORK YOU RECIEVE BUT MAY HAVE A DIFFERENCE IN THE TYPE ON IT. More than just a pretty picture. Make your listings stand out with FREE Vendio custom templates! FREE scheduling, supersized images and templates. The item "RETURN OF THE JEDI MOVIE POSTER 27x41 Style B Original Mint One Sheet STAR WARS" is in sale since Friday, September 1, 2017. This item is in the category "Collectibles\Science Fiction & Horror\Star Wars\VI\Return of the Jedi". The seller is "movieposterbargains" and is located in L. This item can be shipped worldwide.